Ensure your tolerances are achievable and save significant quality costs with Tolcap. So you think Design for Manufacture is important? Good, because you are right! Ignoring design for manufacture can have serious consequences for your organisation’s profit margin - even its survival. Scrap and rework in series production show the costs of these problems can be very high – not just the write off or rework or remanufacture costs, but also the time and effort of quality engineers and designers, who should have completed the design of the current product and be getting on with the next generation. For some organisations we saw these costs run as high as 20% of sales - comparable with profits of many businesses, and confirming that the suggestion that poor design for manufacture puts the future in jeopardy is not over-dramatic. 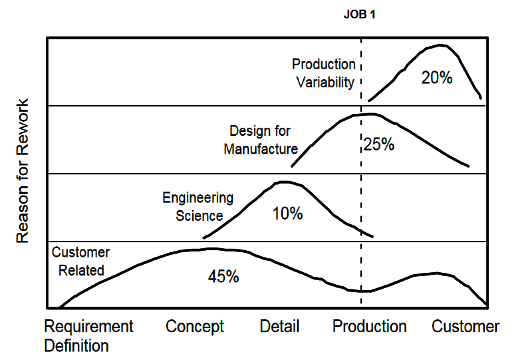 Is (insufficient / inadequate) design for manufacture the biggest culprit? Well, the study appears to suggest the main problem stems from the customer. We all appreciate the customer is right, even when he wants something different, and requirements capture at the front end of a project is vital. But design for manufacture comes next - and if we combine that with ‘production variability’, that is inability to hold the necessary tolerances - then design for manufacture is right up there, and no doubt some customer issues are design for manufacture too. Engineering Science problems - that is issues such as the performance or strength of the product - are much less frequent. We would hope and expect that, because the major portion of engineering expenditure is targeted at performance and robustness. Shouldn’t we look to route some of our resources to address these other expensive problems? Design for Six Sigma programmes stress the importance of requirements capture and provide some methods and tools for this and for concept design. But few of these initiatives seem to address the topic literally and fundamentally: how do you put tolerances on drawings that can be achieved to six sigma capability? Tolcap offers a simple web based application that gives a prediction in a few seconds of process capability for a toleranced dimension for a wide range of processes and materials. From the earliest concept stages of a design, find out rapidly which dimensions should be fine, which are just not achievable in the technology, and those in the middle that need to be discussed with the supplier and evidence from similar parts or test pieces obtained. Tolcap is available at a very modest cost (£1995 annually at the time of writing): a very small fraction of the engineering budget and extremely cheap protection against the huge quality costs of inadequate Design for Manufacture.